Do you have what it takes to be a standout leader? To be considered for top supervisor jobs, resume expert Kim Isaacs says it helps to have a comprehensive resume. 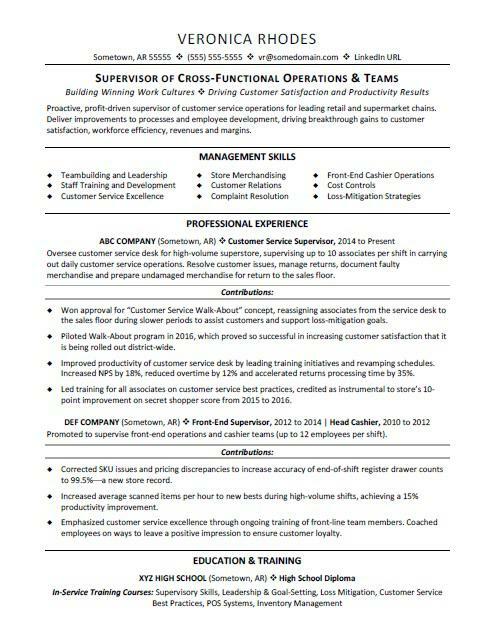 For resume writing tips, view this sample resume for a supervisor that Isaacs created below, or download the supervisor resume template in Word. And if you need more help, get a free resume evaluation today from the experts at Monster's Resume Writing Service. Management jobs are projected to grow 8% (or 807,300 jobs), according to the Bureau of Labor Statistics (BLS) from 2016 through 2026. Working in management, you can expect to make a median salary of $102,590 per year. Find all supervisor jobs on Monster. Proactive, profit-driven supervisor of customer service operations for leading retail and supermarket chains. Deliver improvements to processes and employee development, driving breakthrough gains to customer satisfaction, workforce efficiency, revenues and margins. Oversee customer service desk for high-volume superstore, supervising up to 10 associates per shift in carrying out daily customer service operations. Resolve customer issues, manage returns, document faulty merchandise and prepare undamaged merchandise for return to the sales floor. Won approval for “Customer Service Walk-About” concept, reassigning associates from the service desk to the sales floor during slower periods to assist customers and support loss-mitigation goals. Piloted Walk-About program in 2016, which proved so successful in increasing customer satisfaction that it is being rolled out district-wide. Improved productivity of customer service desk by leading training initiatives and revamping schedules. Increased NPS by 18%, reduced overtime by 12% and accelerated returns processing time by 35%. Led training for all associates on customer service best practices, credited as instrumental to store’s 10-point improvement on secret shopper score from 2015 to 2016. Promoted to supervise front-end operations and cashier teams (up to 12 employees per shift). Corrected SKU issues and pricing discrepancies to increase accuracy of end-of-shift register drawer counts to 99.5%¾a new store record. Increased average scanned items per hour to new bests during high-volume shifts, achieving a 15% productivity improvement. Emphasized customer service excellence through ongoing training of front-line team members. Coached employees on ways to leave a positive impression to ensure customer loyalty.